It has been suggested that Merovech refers to the Dutch river Merwede, once called Merwe or Merowe. Although this river was historically a main subsidiary of the Rhine, in modern times it is a tributary of the Rhine-Meuse-Scheldt delta, the area where, according to Roman historians, the Salian Franks once dwelled. His name is also close to Marwig, lit. "famed fight" (compare modern Dutch mare "news, rumour"/vermaard "famous" as well as (ge)vecht "fight" with -vech). There is little information about him in the later histories of the Franks. Gregory of Tours only names him once as the father of Childeric I while putting doubt on his descent from Chlodio. Many admit today that this formulation finds its explanation in a legend reported by Fredegar. The Chronicle of Fredegar interpolated on this reference by Gregory by adding that Merovech was the son of the queen, Chlodio's wife; but his father was a sea-god, bestea Neptuni. 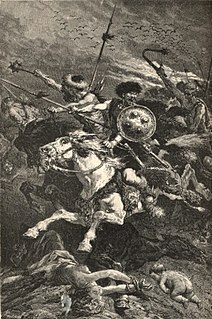 Some researchers have noted that Merovech, the Frankish chieftain, may have been the namesake of a certain god or demigod honored by the Franks prior to their conversion to Christianity. Clodio, the sometime putative father of Merovech, is said to have been defeated by Flavius Aëtius at Vicus Helena in Artois in 448. Ian S. Wood would therefore place his son somewhere in the second half of the fifth century. Another theory considers this legend to be the creation of a mythological past needed to back up the fast-rising Frankish rule in Western Europe. A contemporary Roman historian, Priscus writes of having witnessed in Rome a “lad without down on his cheeks as yet and with fair hair so long that it poured down his shoulders, Aetius had made him his adopted son”. Priscus writes that the excuse Attila used for waging war on the Franks was the death of their king and the disagreement of his children over the succession, the elder being allied with Attila and the younger with Aetius. As Chlodio died just before Attila’s invasion, this seems to suggest that Merovech was in fact Chlodio’s son. The legend about Merovech's conception was adapted in 1982 by Michael Baigent, Richard Leigh and Henry Lincoln in their book The Holy Blood and the Holy Grail, as the seed of a new idea. They hypothesized that this "descended from a fish" legend was actually referring to the concept that the Merovingian line had married into the bloodline of Jesus Christ, since the symbol for early Christians had also been a fish. This theory, with no other basis than the authors' hypothesis, was further popularized in 2003 via Dan Brown's bestselling novel, The Da Vinci Code. However, there was no evidence for this claim that Merovech is descended from Jesus. The identity and historicity of Merovech is one of the driving mysteries in The Widow’s Son, second book of Robert Anton Wilson’s The Historical Illuminatus Chronicles, first introducing the fish legend to the reader by having the early Merovingians appear in a vision as a hideous fish creature resembling H. P. Lovecraft’s Deep Ones, before settling on a variation on Holy Blood, Holy Grail which goes a step further by identifying Jesus and Mary Magdalene as the bridegroom and bride in The Alchemical Marriage of Christian Rosycross and Merovech as the titular Widow’s Son from Masonic lore and positing that the entire bloodline is descended from alien-human hybrids. ^ A Companion to Gregory of Tours, ed. Alexander C. Murray, (Brill, 2015), 659. ^ Green, D.H. Language and History in the Early Germanic World. Cambridge, England: Cambridge University Press, 1998. ^ Pseudo-Fredegar, Hist. III, 9. Wood, Ian. 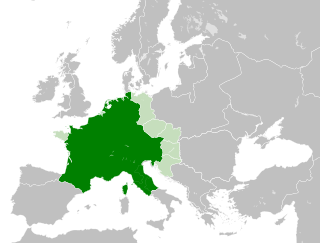 The Merovingian Kingdoms 450–751. London: Longman Group, 1994. Year 447 (CDXLVII) was a common year starting on Wednesday of the Julian calendar. At the time, it was known as the Year of the Consulship of Calepius and Ardabur. The denomination 447 for this year has been used since the early medieval period, when the Anno Domini calendar era became the prevalent method in Europe for naming years. Year 448 (CDXLVIII) was a leap year starting on Thursday of the Julian calendar. At the time, it was known as the Year of the Consulship of Praetextatus and Zeno. The denomination 448 for this year has been used since the early medieval period, when the Anno Domini calendar era became the prevalent method in Europe for naming years. The Holy Blood and the Holy Grail is a book by Michael Baigent, Richard Leigh and Henry Lincoln.